I am writing because I was deeply disappointed with the customer service I received when I called about a train I was on that broke down on February 20th, 2015. For reference, the train was the 94 Northeast Regional and the case number I received when I called was 2936566. For the past two years I commuted weekly during the academic year between New York and Boston on the Northeast Regional. From 2005 to 2009 I commuted between New York and Baltimore on this same line. The train was late nearly every time I took it. On your website it says that refunds are offered with no restrictions or fees if a train is one hour or more late. Most weeks the train would be just under an hour late—54 minutes one week, 58 the next. The February 20th train was, as usual, running fifty-some minutes late when it stopped outside Old Saybrook to pick up the passengers from a train that had broken down. The passengers boarded our train but it soon became clear that we too were experiencing mechanical failure. Amtrak employees ran up and down the aisles as announcements assuring us we would be moving—once the engine was restarted or some test was performed—grew further and further apart until they stopped altogether. Eventually the lights and the heat went out. In the train car ahead of me I could hear a man first read and then scream passages from the bible. As his volume escalated, his voice was joined by thumping and crashing noises. The police arrived—I am unsure if they were called on him or if the thumping and crashing noises were from someone attacking him, and this person was the one escorted from the train. In my own car a man with asthma called multiple people to complain that he hadn’t brought his inhaler on what he thought would be a short train ride, with each phone call he became more irate and between calls his questions to passing Amtrak employees grew increasingly belligerent as he became more and more breathless. 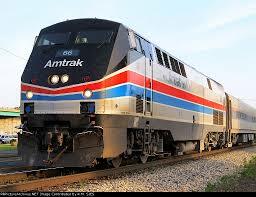 When he finally had an asthma attack one of the Amtrak employees found someone on the train with an inhaler. More Amtrak employees arrived, they distributed glow sticks and told us we were going to use them to walk across the train tracks to a third train that would rescue us all. A blind man was the first to make the journey, escorted by two Amtrak employees unnecessarily lighting his way. The rest of us followed, glow sticks in hand, a slow and bumbling rave in the cold February night. On the third train many had to stand while we made all local stops from Connecticut to Boston. I arrived at 1:30 AM, about three and a half hours late and long after Boston’s public transportation had shut down for the night. The next day I called Amtrak Customer Service to request my reimbursement. The phone operator looked up my train and said that there was no record of its arrival. “That’s because it broke down,” I said. “Well if it never arrived, I can’t give you a reimbursement for a late train,” she said. In lieu of reimbursement she offered me a 25-dollar voucher. The train is a symbol of modernist optimism, a sort of industrial slug asymptotically approaching the horizon of a newer and newer day. The heroine of Any Rand’s magnum opus was a railroad heiress, “a train has the two great attributes of life, she thought, motion and purpose.” The train that never arrives is a train that’s perpetual motion is in service of a purpose affirmed through continual deferment, in other words, a train that’s desire is infinite. But what happens when you are the object of a bottomless desire? How many bodies are sacrificed to this law of ceaseless motion and endless repetition? Snowpiercer, a film about a globe-spanning train with a perpetual motion engine that houses the only people that survived a new ice age, offers one answer. Class divisions on the train are starkly linear, with elites at the front and a lumpenproletariat tail. The film chronicles a revolution that ends in the destructions of the train and all its inhabitants, except two children that escape and are greeted by a polar bear. Children and animals are presumed worth rescuing in this narrative, as they are in most, because they are imagined innocent of the avarice and indifference that built the world that wants to save them. Yet it is always the very images around which we picture our innocence that allow for the most brutal expropriations—there is no limit to the cruelty that becomes possible when we have an image of innocence to protect. This too becomes a perpetual motion machine. So as long as we can only imagine radical change with the same images we use to sell bottled water and tearless shampoo, we have insured the return of the same. Surely one child will make the other its slave, insist she slay the polar bear and bring her master its meat. I did not accept the 25-dollar voucher. What, you might be wondering, would I prefer? I am reminded of hearing the artist Sophie Calle talk about her hesitation to show work she made documenting her mother’s last days for fear of the question, “How much for your mother’s death?” Capitalism offers universality at it most violent, a total system of equivalence in which the greatest tragedy, the greatest work of art, is worth so many tons of tearless shampoo. But what if the purpose of our asking for reparations is not restoration, but instead to offer an impossible demand that will destroy this system of equivalence without equality? What if instead of selling our mother’s death, we try insisting on our father’s? If the train I took on the night of February 20th, 2015 has yet to arrive, let the polar bears drown in the sea and the children choke on their tears. To the infinite train I offer an infinite multiplicity and when this infinitude revolts, we will collectivize the train. In the meantime, kindly respect my body’s finitude and run the trains on a schedule they are able to keep. Public self-gratification is a little awkward.